Colin wants to go exploring in space some more—will babysitting duties leave him earthbound? Colin comes back down to Earth with a bang when his parents force him to look after his annoying little brother, David, for the day. To make matters worse, David has a terrible cold and his constant sniffles and sneezes are starting to really annoy Colin. When Harry lands his space bin in Colin's back garden, things start to look up. 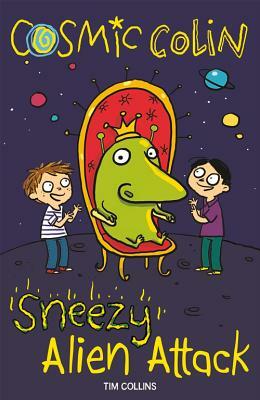 But Colin has a very difficult decision to make: bring his snotty little germ-ridden brother along on a space adventure or leave him at home—alone. Tim Collins is the author of more than 30 books including Notes from a Hairy-Not-Scary Werewolf, Notes from a Totally Lame Vampire, and Prince of Dorkness. His books have been translated into more than 20 languages.